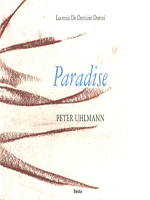 Paradise presents previously unpublished poems and drawings by Peter Uhlmann. Uhlmann was born in Schaffhausen in 1935, and is a lawyer by profession. He has been pursuing his artistic vocation as a poet, artist and photographer for the past 20 years. The drawings and poems in Paradise are inspired by the natural beauty of the Seychelles, where legend has it man was born. The poems are about a journey in the company of the German Maestro Joseph Beuys, redolent with spices, scents, emotions and sensations; while the drawings depict the luxuriant nature of these tropical islands. Among the fruits it is the Coco de Mer, the majestic palm that is also the symbol of the Seychelles, that stands out. The author of the text is Lucrezia De Domizio, who devised and supervises the Living Sculpture Collection series for Electa.